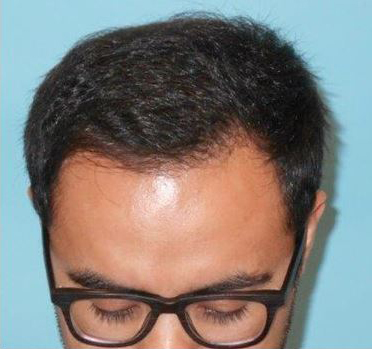 Hair Thickening with Hair Transplant. 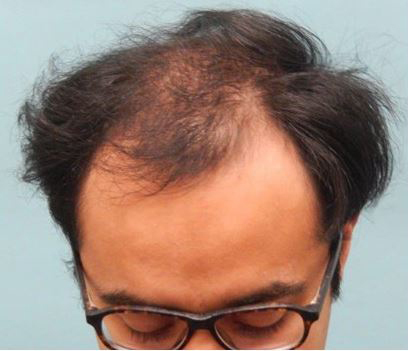 Not all people seeking a hair transplant are completely bald. In fact most are not. They are like this patient of Dr. Dan McGrath pictured above. This young man’s story is quite common. He had thick hair in his youth and even though the sides and the back of his hair stayed very very thick, he steadily lost the front and top. In the photo above you can see that while he still has SOME hair in the top and front the hair shafts are very skinny. This is called MINIATURIZATION. Unfortunately, miniaturized hairs tend to fall out so had he not visited Dr. McGrath in his Texas office he likely would have been slick bald on the top today. During consultation Dr. McGrath decided the best approach for this patient was to fill in the front and top in one sitting. To do this, he would have to obtain a lot of hair grafts from the back and side of the head and then pack them densely into the front and top. In addition, he would have to be very careful to go BETWEEN the existing hair so as not to harm them. They may not be around for long, but a hair is a hair and every one counts so Dr. McGrath takes care not to traumatize them. This, of course, brought up another issue in the doctor’s mind. What happens if he does the hair transplant and the remaining top hair falls out afterward ? Would there be a hole or a gap ? Noticeable thinning ? To address this the doctor made sure to place enough extra new hair to compensate for the continued hair loss so that it doesn’t look strange or incomplete. It worked as seen in the after photo to the right. The area that was completely see through to the scalp has now been covered with thick growing hair. What’s more, the hair and the new hairline look NATURAL. There is no artificial flavor to the result. In fact, it looks as if he is beginning to lose hair rather than getting it back. Dr. McGrath should be commended on the mastery with which he conducted this transformation.